If you need to shorten your dog’s nails easily and reliably, then you should invest in a dog nail grinder. It is most commonly used by show dog owners and pet groomers, but any dog owner can use one too. It is a helpful tool used to shape, grind, and smooth your pet’s nails. Tired of manually clipping your dog’s nails? Then you’ll be happy to hear that dog nail grinders are capable of trimming them safely with no effort. They are powered rotary instruments that come in rechargeable, corded, or battery powered versions. Prior to nail grinders becoming the norm, pet groomers used to rely on rotary tools like the Dremel to perform a similar task. In this case, old habits don’t die hard since Dremels are still very popular today. The reason for this is because Dremel type tools generally are more versatile and powerful. Furthermore, plenty of dog owners already have some sort of rotary tool in their household that can substitute as a nail grinder. See our review of the best dog nail grinders below. Ironically, most dog nail grinders lack the power to efficiently grind the nails down. When a grinder does not have enough power, it makes the process quite arduous and your dog may feel anxious or unwilling to cooperate. Thankfully, the Dremel 7300-PT is not one of those cases. It is rated at 4.8V and grinds at both 6,500 RPM and 13,000 RPM. Start off with the lower speed to get your dog accustomed to the noise and sensation, then ramp it up to the higher speed to make quick work of the nails. 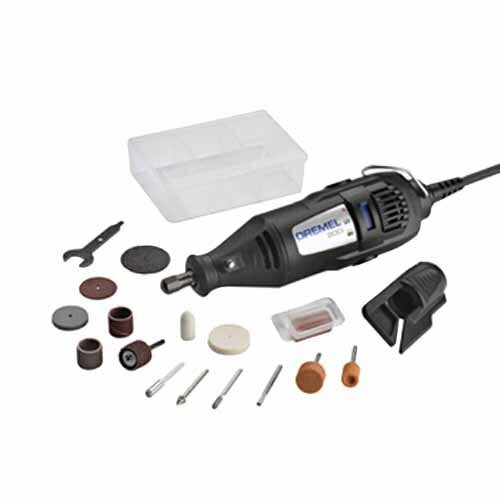 In addition to all this, the Dremel 7300-PT is light, cordless, and simple to hold in various positions. The starter kit contains several grinding bits, such as the 120 and 240 grit. You should start with the 240 grit (coarse) and end the session using the 120 bit (fine). The downside to this grinder is its battery life. Over time, it will not hold as much charge. This means that someday it will run out sooner and provide less power than you expect, however this is a common issue with all cordless tools. We feel that this product is the best dog nail grinder when it comes to value per dollar. The reason being, since it is not limited for use only on dogs (notice how it is not marketed as a dog nail grinder), you can use it for other tasks around your house. 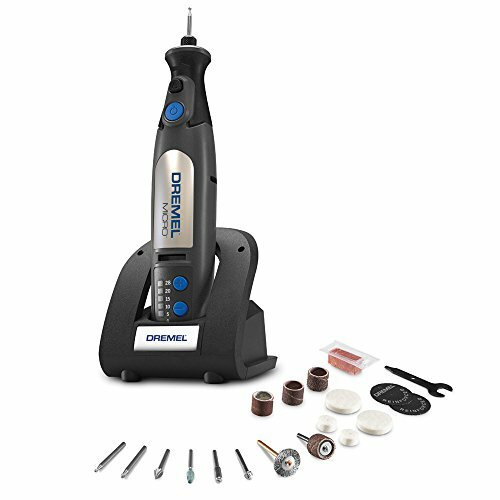 This Dremel is corded and comes with 2 speeds – 15,000 RPM and 35,000 RPM. To be honest, 35,000 RPM will be too much for your dog to bear so you should reserve that setting for other tasks. However, 15,000 RPM should be more than enough to quickly grind down your dog’s nails. Be very careful not to accidently switch to the higher speed setting, as it may alarm your dog. Your dog would also feel uncomfortable with how rough the higher setting is. Since this tool is corded, you don’t have to worry about the power waning or need to recharge it, but it will be less maneuverable. This is the trade-off that you need to decide if it is acceptable or not. Since there is so much extra power, there will be lots of extra noise that may intimidate your dog. In general, corded grinders will be louder than their battery-operated counterparts. The Dremel 8050-N combines the best qualities of the previous two products covered in this review, making it a contender for best dog nail grinder. It features an 8V lithium-ion rechargeable battery that provides the necessary power that the Dremel 7300-PT sometimes lacks when it is running low. Since this is a lithium-ion battery, you can charge it whenever you want without worrying about memory effects. What makes this model stand out is how versatile it is. With 5 speeds starting at 5,000 RPM all the way up to 28,000, this is definitely the model you use to ease your dog to higher speeds. This alone is reason enough to justify its price tag. Furthermore, since it is a cordless model, it is very easy to wield and handle. The build-in LED provides some much needed light to help you with the grinding. Included with this package are 18 various tool bits that can help you with various tasks like engraving, sanding, cutting, and even buffing. With so many features and so many ways you can use them, it costs a pretty penny for being one of the most versatile grinders on the market. Why Use a Dog Nail Grinder? If a manual clipper can do the same job, why should you spend more money for a more expensive product? The answer is simple: convenience and safety. Dog nail grinders allow you to rapidly grind off small bits of the nail rather than haphazardly cutting off large sections of it. This process is much safer and drastically reduces the chances of you cutting into your dog’s quick. Furthermore, after using a dog clipper, you still need to take a dog nail file to flatten and smooth out any sharp edges that remain. 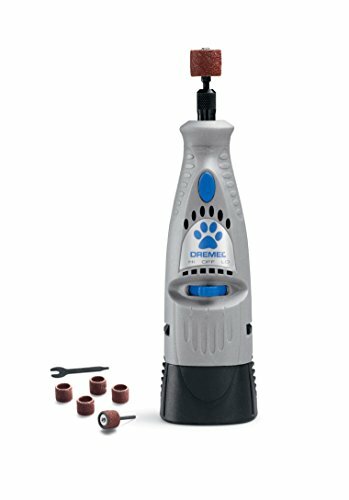 With a dog nail grinder, the grinding action already has the added benefit of smoothing out your dog’s nails with precision. You can get at it in all sorts of different angles, which encourages the quick to recede. Next, using a nail clipper can sometimes crack your dog’s nails if the blades happen to be dull. Thus, you should rely on a nail grinder to provide a safer and healthier grooming environment for your dog. Think about it: smooth shortened nails with no cracks, or shortened (but still sharp and possibly cracked) nails that you’d have to file down afterwards. So you’ve heard why we think you should have a nail grinder, now let’s hear the counterarguments. First, they can be quite noisy and scary to dogs that are unaccustomed to them. You will have to slowly introduce them to it or else they will never calm down. Next, anything that relies on energy naturally produces heat, and this is no exception. Be careful if you leave it running for too long, it may start to heat up. Also, if the dog’s hair near its paws are long enough, they could get tangled in the head of the grinder, so you would need to trim the hair before grinding. As you may have realized, grinding down a nail is slower than simply cutting it. In order to speed up the process as much as possible, the right grinding bit must be selected. Lastly, grinding the nails down does produce a fine nail dust, so you would need a special area where you can easily clean up any nail residue. As the pet grooming market expands, there is a wide selection of dog nail grinders available with more on the way. From our experience, we have found that standard rotary tools like the Dremel is the most versatile. Not only does it have a lot of power, but it can be used for additional tasks other then dog nail grinding. The only con we can think of is that Dremels that are non-pet specific are more expensive than pet specific grinders. If possible, find one that has changeable speeds. The more the better. This is so that you can ease your dog into it at a slower speed. Then, as she becomes comfortable with the noise and the sensation of having her nails grinded down, you can slowly increase the speed further. In the same vein, try to select a grinder where you can switch the grinding bits. You will then be able to use the right bit for the job; coarse grit for the bulk of the grinding, and a finer grit for the finishing touches. Lastly, be sure to find a dog nail grinder that has enough power. You do not want to make a difficult task even harder, so be sure your Dremel is up to the task. A lot of popular and commercialized products are quite lacking in this regard. You will not be able to get the job done if your dog is anxious and shuffling around. Thus, you must calm your dog down as much as possible, and the best way is to offer her treats. You can do this by associating the sound of the grinder and your dog receiving a treat. From your dog’s perspective, the Dremel sound suddenly becomes a bearable, perhaps even an enjoyable sound because she associates it with the imminent arrival of tasty treats. Take your dog to the regular grooming location. Show her the treat and have her lie down. Reveal the dog nail grinder, turn it to its lowest speed setting and bring it close to her. Soothe your dog by petting and praising her. Give her treats periodically to calm her down. Repeat this process for of positive reinforcement until your dog cannot tolerate it anymore. Never force your dog beyond what she can handle. That is a good way for her to permanently have bad memories of this incident, and grooming her in the future will prove to be difficult. You may have to keep sessions short, and spread sessions out over several days to complete the task. This process is much easier if performed since your dog was a puppy. As an adult, she will be accustomed to this because of her youth. Adult dogs who’ve never experienced this have more trouble coping with the stress. If this is the case for you, you may be forced to use the dog nail clipper, or you may take her to a professional groomer. First, lay your dog comfortably, preferably on her side. Turn on the nail grinder and wait a moment so your dog can “warm up” to the noise before you get started. Using short strokes, start grinding the tip of the nail to remove small increments. Be wary of your dog’s quick. If the nail is still a little dry, you can keep grinding; if it is slightly moist, you are almost at the quick and should stop. Grind down from top to bottom, and work on the sides a little bit as well, making sure to do so in small increments. If you were using a coarse grit bit this whole time, finish off the session using a finer grit bit to smooth out any rough edges. Once finished, comfort your dog by giving her treats and lots of praise. Every dog reacts differently to having their nails groomed, so hopefully your experience dog was cooperative and the overall experience was positive for both you and your dog. If you notice signs that your dog is in serious distress, cut the session short and try again some other day. Always end each session on a positive note (i.e. give your dog treats and praise her).